Nintendo is tempting the wrath of the Beeb by refusing to allow a 15-second clip of the Mario theme to be used in the upcoming biopic Justin Bieber: Never Say Never. First things first: yes, a movie about teenage singing sensation Justin Bieber has been made and it's coming out in February, in 3D no less, directed by a guy whose previous credits include Step Up 2, Step Up 3D and something called The Legion of Extraordinary Dancers. And while the surging ranks of the Beeb Army will no doubt fall upon one another like vicious, half-starved wolverines in their zeal to be at the front of the line, there's at least one group of people that apparently wants nothing to do with it: Nintendo. "aw C'mon Nintendo! Y won't u let us use the Mario theme for 15 secs in the @Justinbieber movie," director Jon M. Chu wrote on Twitter. "talk about free advertising passed up. Oops"
What's the deal? It's not as though Nintendo has a thing about licensing its music for use in movies; as MTV Multiplayer pointed out, it allowed the use of music from The Legend of Zelda: A Link to the Past in last year's Scott Pilgrim vs. The World. No, this is something different, something more personal. Clearly, Nintendo hates the Beeb. Okay, maybe that's overstating the situation a bit, but I think it's fair to say that Chu is too, when he suggests that Nintendo is somehow going to lose out for not supporting this film. I rather suspect that Nintendo will continue to do just fine, with or without the Beeb's pouty puss on its team. 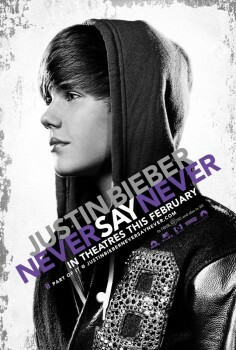 Justin Bieber: Never Say Never hits theaters on February 11. Don't miss it!